From the 8th until the 14th of April, you can find EUROPOWER in the Messe München trade fair center. We'll be at booth A5 314 every day. 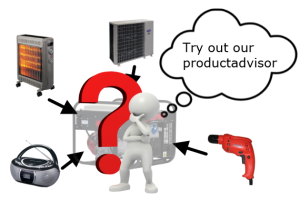 The Product Advisor is a useful tool if you are looking for a generating set based on specific applications you have in mind. These applications are split up in categories such as: electric motors, household appliances, lighting and small tools. Please fill in this form if you want us to contact you.